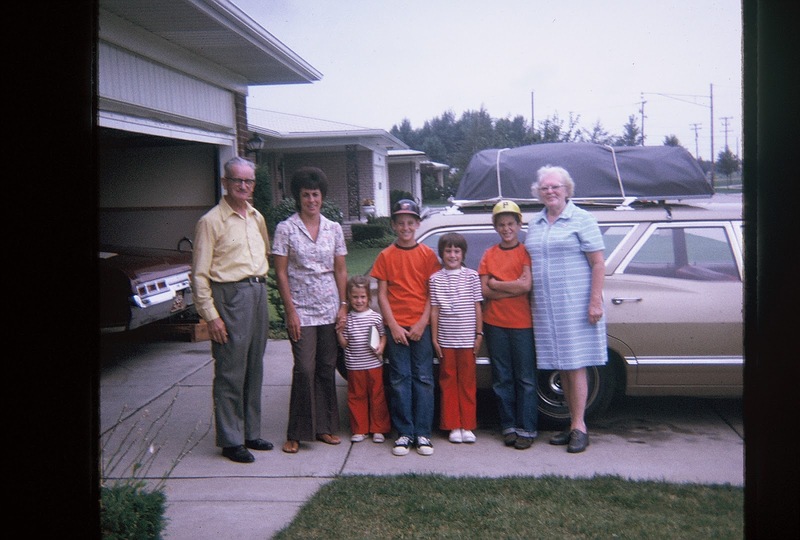 Mid 1970's/On Vacation visiting our Grandparents in Detroit, Michigan. 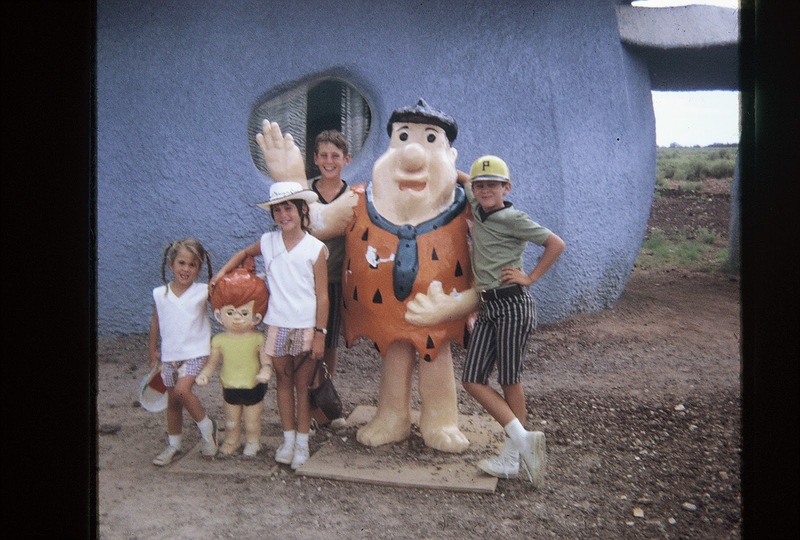 Flintstone Village...on our way to the Grand Canyon, Arizona. The Grand Canyon, Arizona, Mid 1970's. Watching my mom sew throughout my childhood, one can only imagine my own excitement as I myself learned to sew during my high school Home Ec. class. (1980 & 1981)I loved it!!! Man, we had so much fun. Best homework I ever had! 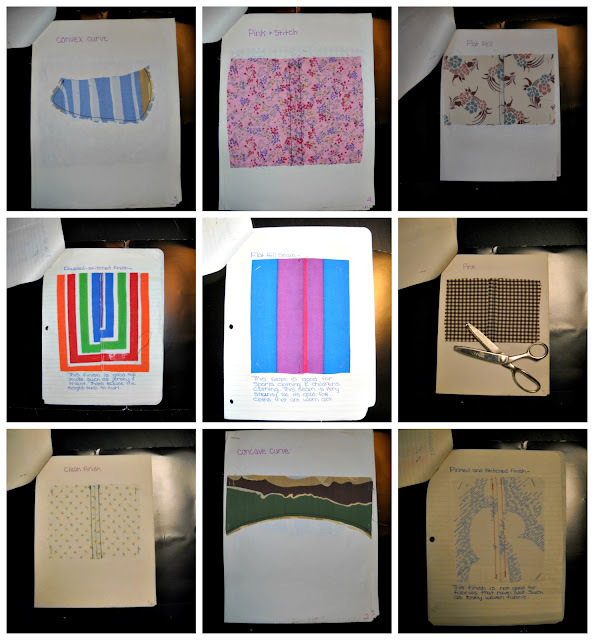 Serious....look what I found while rummaging through my own sewing room today...my old "seam assignments!" I'm telling you, all through high school I made myself many of dresses and only wish I had the pictures transferred to my computer to share with ya. You'd crack up I'm sure! I mean, I can remember us girls planning a "dress" day to parade our finished projects around school. LOL! So fast forward though the college years...when, as a young wife and mother (Early 1990's), I actually found myself buying my very first sewing machine at a garage sale for $50.00. I cherish these memories of being a young mom, personalizing our very first home by sewing all our curtains and creating matching chair seat covers for our dining room. It was so relaxing to throw in a load of laundry and sew during afternoon nap times. (Even when the girls grew out of naps, I made them rest so I could sew!) Again, I wish I had pictures transferred to my computer. Though the hobby of scrapbooking consumed my time and fulfilled my desire to be crafty during my years as a young mother with a growing family, I did manage to complete two quilts. They are: My Sunflower Quilt and Irish Chain. I took my first piecing class in September of 2009 and made the above Pinwheel Quilt. I started blogging one summer day in June of 2013 and have never looked back! I continue teaching myself the art of Long-Arm Quilting. absolutely enjoy quilting and consider it a true "work of heart"! I'm so grateful for our blogging community, as without our friendships and support of one another, I don't know if this journey would be as much fun and as rewarding. So thanks for that! When did you begin to quilt? And a big shout out to Jenn. Thanks for the motivation to share my journey to quilting as I link and share with everyone at your Throwback Thursday Linky and Lorna's Let's Bee Social. Your vacation photos to visit Detroit in the station wagon with stuff piled on the top reminded me of National Lampoons Family Vacation. :O Your mamma did a good job considering, my mom used to make polyester jumpsuits for my little sister that zipped up the front for her. How cool that you still have your work from high school, but then you can't be too many years past high school age anyway? Right? Right!!! LOL! 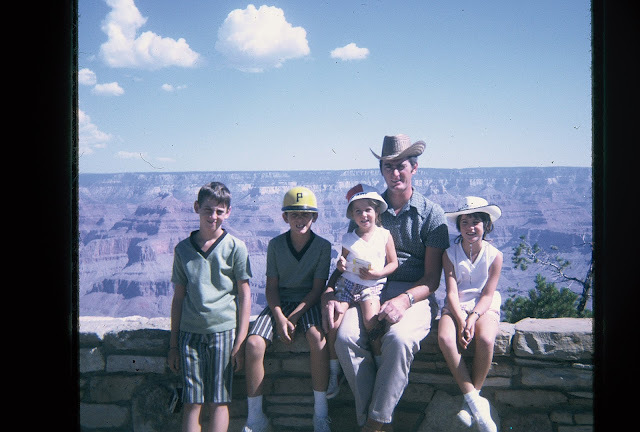 I know...it amazes me in reflection that we traveled from Arizona to Michigan in that station wagon! Great memories for sure of fighting over who sat in the front, back and got squished in-between. What a very cool walk down memory lane. I love that you kept your seam projects from Home Ec. I was disappointed to find out that they have completely done away with classes like this in our area. The poor children have no idea what they are missing. I love your story, Val. That is an amazing first quilt!!! Mine was Yellow Brick Road from Atkinson's Designs...a lap size to boot. Thanks for the walk down memory lane. I made a couple of quilts for my babies but fell head over heels in love with piecing when I became an empty nester. To my sons horror I flew to a retreat in Michigan, not knowing a soul. I so appreciate all the wonderful encouragement I have received from so many talented quilters. Oh, this was a delightful read!! The pictures are a hoot, but so precious. I remember that sewing knits was a BIG deal at that time, so I can see why your mom did what she did. And your notebooks from home ec are priceless! I'm jealous--I took an bookkeeping class instead of home ec and I still regret it, especially for my cooking/baking skills. But my friends took home ec and I tagged along with them shopping for fabric, and we made matching dresses. My mom taught me to seriously sew during the summer between 7th and 8th grade (before that I made poorly constructed doll clothes) and for years I made my own clothes. I started quilting in 1979 and really got going with quilts when my friends and I started having babies. Your first quilt is amazing!! Thank you so much for pulling me down memory lane with you. I can so relate to this post! First, your pictures made me go down memory lane too! We always had matching outfits, new, old or hand-me-downs. And then Home Ec! It was the best ever class and perhaps the only one I ever got good grades in! While it was fun making clothing, I never quite took to it. I dabbled here and there and even after my daughter was born. But nothing turned out good enough for me. I'm so wanting to give it a try again. I figure with my quilting experience and age and patience...I could do a much better job! My daughter was the one who got me hooked on quilting! I can never thank her enough! I grew up with my mom sewing matching clothes for my sister and I. My first sewing project was doll clothes for my sister's Barbie (it was a Christmas present). My grandmother quilted, lots of scrap quilts that I loved, but I never took to it. Then my sister and I took a quilting class together, and we loved it. Unfortunately I lost my job and my mom's health declined so we packed everything away for several years. After my mom passed away we decided to pull it all back out and we've not looked back since. I love that you have all the photos from your classes. I taught myself how to hand sew doll clothes at 6 with needle and thread. At 10 I was giving a sewing machine and was told I was now responsible for making all my clothes. So I taught myself how to use a machine and read a pattern. Just don't ask me about the men's shirt I made for my boyfriend (now husband) with the buttons on the wrong side. Thought surely it was a typo. Didn't know the guys buttoned their shirts backwards. :) I taught myself how to quilt while pregnant with my first born. Again I thought there was a typo and put in 1/2 inch seams (assuming it was a "craft" vs. garment project). Needless to say it didn't quite match up. :) I know to do better now. This was such a fun post to read - I'm so glad you saved the book! It's so fun to reminisce about our growing up lives. I love the outfits your mom sewed - they are adorable. i am a self-taught sewist, although it was my mother who got me started on quilting. I don't sew clothes at all anymore - just art. But what fun it is. Thanks for sharing your great photos and I hope someday you'll share the clothes you made, too. I loved reading this post! I didn't have homemade clothes as a child because my mother didn't sew. I learned from my grandmother, and began making my own clothes in college. I bought my first machine then and I still have it today. I did have home ec too, I think all schools dropped it years ago. Too bad, boys should know how to cook and sew, and every girl should be able to handle a screwdriver and hammer. Such a fun post! I am totally self taught. But I took shop class and loved every second of it! LOL My hubby taught me to thread a machine that my SIL gave me. I pieced my first quilt when my son was a year old. I have been at it now for 28 years! Gosh, I'm old! My mom sewed all our clothes too Val. My sister and I had these knit outfits that she remade over and over again starting as pants and turtleneck sets when we were 8 and 9 and finally ended up as shirts and cap sleeved summer shirts when we were in our late teens. I'm impressed by her ingenuity now. So your wonderful photos brought back those memories. My three kids used to not like it when I dressed them in matching clothes either. I did it so I could spot them quickly in crowds. I find it interesting that your mom was not the one who taught you how to sew. Mine didn't either and we learned in 4H club with out neighbor. They were probably too busy taking care of us and making ends meet. What you wrote about quilting and blogging strums my heart chords too! Amazing to read this particular post, because my old home ec teacher has been on my mind a lot as I've been picking up sewing clothing again. Everything I know I learned from her. My skills are rustier than heck, but they're still there. I've been meaning to write a post about it...you've spurred me on. Home Ec was my favourite class. I took it in 7 th grade. I wish I had carried on with it...continued to sew through my school years like you did, but I didn't pick kt up again until I was married. Then I went through a spurt of sewing all kinds of clothes. Then dropped it again for a few decades. When I returned to my sewing machine, it was to take my first quilting class. Only lately have I decided to relearn clothing construction. Love your Throwback Thursday post Val! Those pictures are precious! I avoided anything related to Home Ec as a youngster, until I was hit with the domesticity bug while pregnant. Taught myself to sew with baby clothing, thanks to Sunrise Designs! Without a clue, I pieced the leftovers into his first quilt. A stretchy mess, but I was hooked! My HS offered factory sewing, making jackets & such. I sure regret avoiding the opportunity! Oh the matching clothes! They crack me up! And I wish I'd had that kind of homework in high school. I might have actually done it. 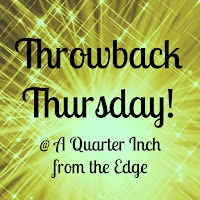 Thanks for sharing how you got started in quilting and for linking up with Throwback Thursday @ A Quarter Inch from the Edge! My mum didn't make our clothes, but I do remember my sister and I were nearly always dressed in the same outfit when we were younger - I think it must have been the trend at the time. I remember having a term of sewing classes in year 8. I was all about speed and had absolutely no control - I had no idea how people could sew a straight-line with a sewing machine. I sewed a few things by hand, like dolls for friends, etc, but otherwise had very little sewing experience. I got my first sewing machine when I was about 25 or 26, and found that it was actually a lot of fun - and not too difficult once you learn to control the foot pedal :) Now my only setback to sewing is the cost of fabric and finding the time. Great Throwback Thursday post! My first sewing machine was a Lidl Lervia for 59 euro! It was very nice to read your story. Except from sewing projects at school, I started sewing about 16 years old when I got my first sewing machine. I made some clothes by following a sewing course by mail. I can't say all of them turned out nice, but I remember a jacket that I used for many years. When my first son was born I made many clothes for him. It was my first period of interest for reuse. My jeans with wide legs had lots of fabric to make him overalls. My quilting interest started at the early 80's. My sister in law went to a quilting class and she taught me some basic. But most of my sewing I have learned by myself. Awww. I enjoyed reading your journey Val. I learned to sew in Home Ec class in middle school I believe. Though I enjoyed it, it wasn't too appealing, but I didn't own a sewing machine. My friend Crystal taught me how to quilt in 2011, and it's totally a "happily ever after" experience for me. Thanks for sharing. Loved reading this post, Val! My mother also made most of our clothes. I was proud of her talents. She even made my prom dresses and wedding dress. As for me, I only sew quilts. I honestly don't have the knowledge to sew clothing. I loved reading about your quilting journey. I wouldn't be the quilter I am without my mom. Oh wow, I too am a survivor of matching dresses, tops and pants. Love the travel photos! Val, this is great. Thanks for sharing your journey. This is a great idea and I love the photos. (I might just 'borrow' this idea for a future post!) I learned to sew at age 9 a the Singer Sewing store in town. My grandmother made sure I learned how to sew. Boy am I eternally grateful to her!!! I have moved from clothing to just quilts, but made a lot of my clothes, prom dresses, etc. I drew the line at my wedding gown though!